This pavilion was made possible by a donation from Paul Harvey’s uncle, Bruce Kougher, in 1988. It houses the museum’s collection of "half breed" engines; steam engines that have been converted into gas engines. These engines were very typical throughout the old oil fields and many combinations of steam frames and gas cylinders were made. Uncle Bruce was a truck driver and gave Paul his first driving lessons and his love for trucks. Upon his retirement, he devoted many hours to the museum. Enjoy the collection that it houses on these following pages. 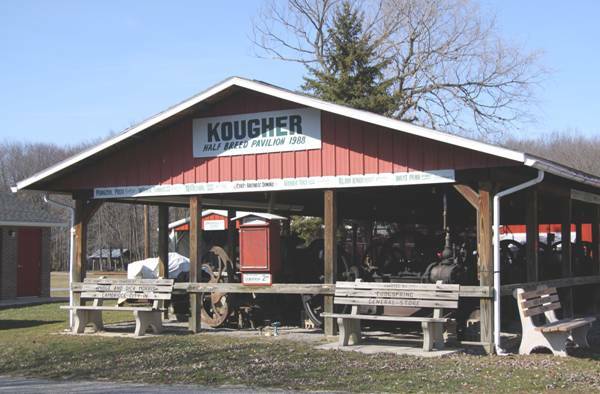 The Kougher Half Breed Pavilion.